This book was a Netgalley find and the synopsis had all the magical, fantastical trigger words to pique my interest. Fantasy novels are like cravings for me and they never quite go away. I just climb the stacks and grab as I go, thankful that the fantasy genre is like a delightfully bottomless pit of stories and worlds perfect for escaping to. 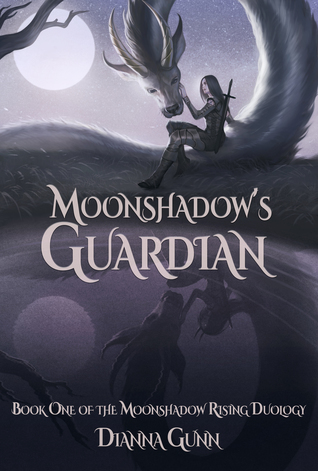 So, about Moonshadow’s Guardian…. This is not a bad book, or boring read by any means. I’ve been teetering on my 3 star rating and wondering if maybe four stars is better suited. But I’m sticking to my original feelings, the ones fresh after finishing the last page. So rather than rant and rave about why I didn’t like this as much as I wanted to, let me start by telling you what I absolutely LOVED about Book One of the duology. The pages of this book are packed full of all sorts of different fantasy elements and characters. You’ll find a magic system with characters who know how to use it (and those who don’t understand it and therefore are afraid of it), demons and an underworld, ties to Greek mythology, architecturally stunning cities, spirits, vampires, and the most friendly dragon you’d ever want to meet. And one of the most impressive parts of this book is that it doesn’t hinder itself by sticking to the same fantasy genre rhetoric that can tend to get slightly boring, overused, and just worn out. It ties all sorts of these elements together in a fresh way, and leaves you with a story you DON’T feel like you’ve heard before a thousand times. A thousand thanks to the author for this. At the end of the book I was wishing for more, the way a good read can tend to do. But that was the big problem I had…I was wishing for more detail, more backstory, and a deeper understanding of the world I had just spend hours trying to explore. What was truly lacking for me was that I felt the book should have been longer and allowed more room for development of every single element I have mentioned so far. I’ll only give one example so I don’t rant for days. Our main character is a demon, and by the time her character story really comes into play she is already a couple centuries old. She has worked with the god Loki for centuries and yet there isn’t much about there time together except a few snide comments related to bad memories here and there. NOT ENOUGH. I felt no connection between the two characters and their relationship should have been a wheel house of interesting history. CENTURIES worth. And while it isn’t always necessary to go back and rehash every part of a character’s history, it absolutely is when every aspect of said character’s demeanor is based on their memories and past. The dynamic between these two characters kind of feels like a constant stream of inside jokes that we the readers are invited to listen to, but won’t be hearing the explanation for. And while the narrative jumps back and forth to give the reader some perspective, it is nowhere near enough, and takes us to key events in the past that leave you wanting to know more of the backstory rather than give you all you need to know for the present narrative. That’s how you become emotionally invested in a character and I was disappointed to end the book and feel like I had missed out on what could have been an absolutely amazing story. I honestly think there is enough to work with here in just this one book to start a series, because that is how long it would take to truly impact the reader the way the author intended to. The book just felt very surface level and rushed. When there are these many elements jam packed into a story, there just needs to be more room for growth. The majority of the story left me feeling like I had come into a movie at the tail end, and no one was willing to rewind so I knew what the hell was going on. Regardless, I have high hopes for the second book and I’ll be looking intently for it. I hope it gives more insight and contains a bit more of that history our characters keep hinting at. And overall, though it may seem like I secretly hated this book, I did enjoy the introduction of a story that could turn out to be fantastic and the journey was well worth the time spend reading. This was only book one and there is more to come with book two. I will be anxiously awaiting the conclusion.